Nothing compares however to the experience of soaking in an aquatic bathtub after a long day. It is a perfect combination of luxury and quality, of leisure bath and healthy water immersion. The aquatic bathtub provides for a more relaxing and soothing experience than any ordinary tub out there. It is like having your own spa in the comforts of your home. It is all about hydrotherapy. Hydrotherapy is one method of treating a disease through the use of water. It is deemed to be used by ancient Greek doctors. Hydrotherapy or spa treatment can be used to address various problems. The warm water can relax spasm, very useful in alleviating sprains, muscle sprains, fatigue and backache. Sitting in hot water alone, or a sitz bath, is effective in treating swollen hemorrhoids. Physiotherapy is another area that makes use of water. The buoyancy of water allows an ailing limb or strained muscle to be moved or exercised, as there is less pull of gravity when immersed in a tub of water. 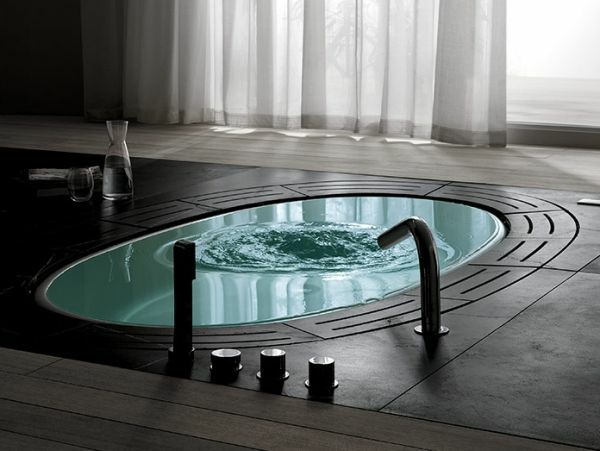 Whirlpool is a special feature in most bathtubs to have an effective hydrotherapy experience. It is water spinning in a circular motion around a central area. Heat is used together with this whirlpool bath, to effect a stimulating treatment or massage in an aquatic bath. In deciding over an aquatic bathtub, there are hundreds of selections to choose from, with more than 1,500 distributors worldwide. There are premium designs that come with many luxurious features. There are the economical ones that will provide the basic needs of a spa treatment. Seek an aquatic bathtub that has raised seats, arm rests and lumbar support. These features should be secured to enjoy a long soak. Neck jet pillows and shiatsu back jet system are some of the most sought-after features. Hydrotherapy jets are installed to provide also the ultimate massage experience. Since this bath is about relaxation, some manufacturers have already provided for floating remote control. Any features of the aquatic tub can be turned off and on without having to move from the relaxed stature. The selection provides a wide range of style and sizes. The features are made even more user-friendly now. Anyone can configure the features to focus on a specific area of discomfort. With these features to watch out for, getting an aquatic bathtub is really a must. It is like having a hot spring in the confines of the household. Anyone can take a dip, any time of the day.